The Universal Monsters movies from Universal Studios are Hollywood’s seminal horror franchise. Creating such pop culture icons as Bela Lugosi’s Dracula, Boris Karloff’s Frankenstein Monster, and Lon Chaney, Jr.’s Wolf Man, the characters became synonymous with the horror film genera. And while Lugosi, Karloff, and Chaney Jr. played other characters within the franchise, they are forever linked to the roles they so memorably originated. Just as quintessential are Karloff’s Mummy, Elsa Lanchester’s portrayal of the Monster’s bride, Ricou Browning’s underwater performances as the Creature, and Claude Rains’ depiction of the Invisible Man. Unlike the big three of the Universal Monsters, however, these portrayals were merely career highlights and not career defining. Still, each of these horror archetypes are instantly recognizable the world over. Acclaimed comics artist Alex Ross honors these screen legends through this stunning Sideshow exclusive print. From their extremely limited set of Universal Monsters fine art lithographs – which sold out the same day they were released – the print is signed by hand by Ross and is individually numbered out of only 100 produced. Painted in glorious black and white, just as the movies were originally filmed, the lithograph measures 18 by 24 inches, is in nm/mint and undisplayed condition, and will be shipped with the utmost care. It includes its original Certificate of Authenticity. This particular print features Bela Lugosi as the lord of vampires in the 1931 film Dracula. Widely regarded as the definitive Dracula, Lugosi’s commanding presence, his Hungarian accent, and his powerful performance continues to captivate audiences to this day and set the standard by which all other vampires are measured. 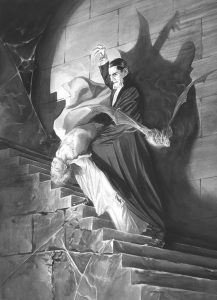 Ross creates the perfect tribute to Lugosi’s iconic role, illustrating Count Dracula in a dramatic pose with Mina Harker as he descends the staircase in Transylvania’s Castle Dracula.